Unlugar.com Review 2019: Is Unlugar.com a Good Hosting? Unlugar.com is an Argentinian hosting company that has been operational for more than 14 years. The vendor provides web hosting solutions and domain name registration among other services in Argentina and beyond. Unlugar.com is a hosting company based in Argentina. The company started its operations more than 14 years ago. Over the years, its grown in size and experience to provide quality and reliable hosting services to individuals and business enterprises in Argentina and beyond. Besides offering shared hosting solutions, this vendor offers other internet services to its clients including reseller hosting, web design solutions, and email marketing as well as audio/video streaming solutions. Its website is only available in Spanish but support is available in English as well. Unlugar.com servers are housed in its own data centers located in Claro, Argentina. The vendor has put in place all necessary security measures and infrastructure to create an ideal environment for optimal server performance. This vendor’s shared hosting solutions come in four packages: Promo, Initial, Developer, and Business. The Promo package is the most basic as well as the most popular. It comes with 4GB disk space, 240GB bandwidth, three MySQL databases, and up ten FTP accounts. Unlugar.com’s premium shared hosting package comes with a disk space of 10GB, two domains, 500 MySQL databases, and 500GB monthly bandwidth. The package is ideal for commercial websites. Unlugar.com backup services are performed on a weekly basis, but there’s little else the vendor has said about this solution on its website, including how many days each week‘s backup is stored. In addition, the vendor gives no guarantees that its backup solution would accurately replace a user’s data files every time they’re lost. This company’s hosting services have limited features and do not include SSL certificates. While Unlugar.com’s hosting solutions appear quite cheap, only users who subscribe to the five-year contract can take advantage of these extremely low prices. Shorter contracts attract higher hosting fees. The minimum contract period available is three months. Unlugar.com offers a 30-day money-back guarantee. Although there is a mention of uptime guarantee on its website, nothing more is said to bring clarity to the issue. Customers wishing to contact this vendor can do so through email, submitting a ticket, or via telephone. However, the phone support is only available from 9:00 a.m. to 6:00 p.m. ART from Monday to Friday. In addition, the vendor does not offer live chat support. Although they claim to have a support team available 24/7/365, when I contacted them, they didn’t reply to my email. 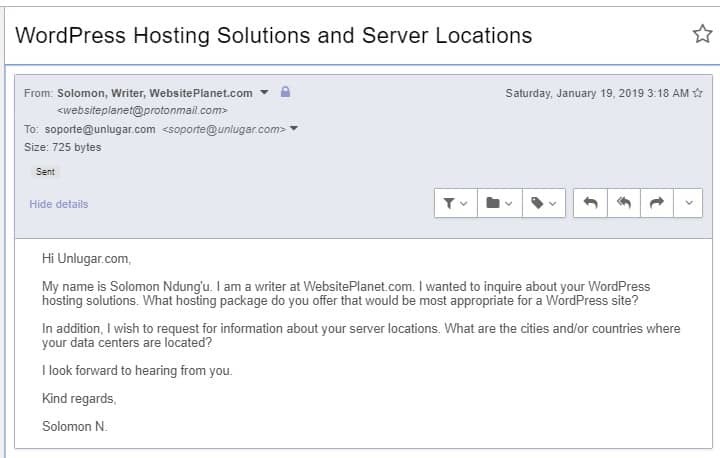 Unlugar.com has a knowledge base but it is practically empty, meaning that clients who prefer using a web host’s help center’s tutorials to solve the hosting issues they face would definitely be disappointed. Unlugar.com hosting solutions seem to have the features necessary to satisfactorily manage websites for small and medium-sized enterprises. For a hosting brand that has been in the industry for over 14 years, it is a bit disappointing that it has not improved its solutions over the years, including making sure that its support team is available round the clock and that customers can access a comprehensive knowledge base on its website. Wondering how Unlugar.com stacks up against other Web Hosting companies? Enter any other Web Hosting company and we will give you a side-by-side comparison.